Summer is the perfect time to get out and travel to wonderful places to draw. Recently I spent four days on Lopez Island, in the San Juan archipelago. Fifteen friends from Plein Air Washington Artists met there to draw and paint. It was a thoroughly enjoyable weekend, sharing the love of art with these wonderful friends. I made a discovery on this trip. I brought my oil paints thinking I would paint in the morning and draw in the afternoon. After two awkward attempts at painting I decided to stick with ink and watercolor. Drawing is now so natural for me, and certainly simpler. Instead of tripod, easel box, canvases, heavy backpack with paint, brushes, turp jar, paper towels, and sketchbook for thumbnails, etc., all I need for drawing is a paper, a pencil, and a pen. One morning we took the trail out to the southwest end of the island, Iceberg Point. It was less than a mile walk and I was grateful not to be carrying my heavy oil supplies. I did several sketchbook drawings of views from a rocky point. 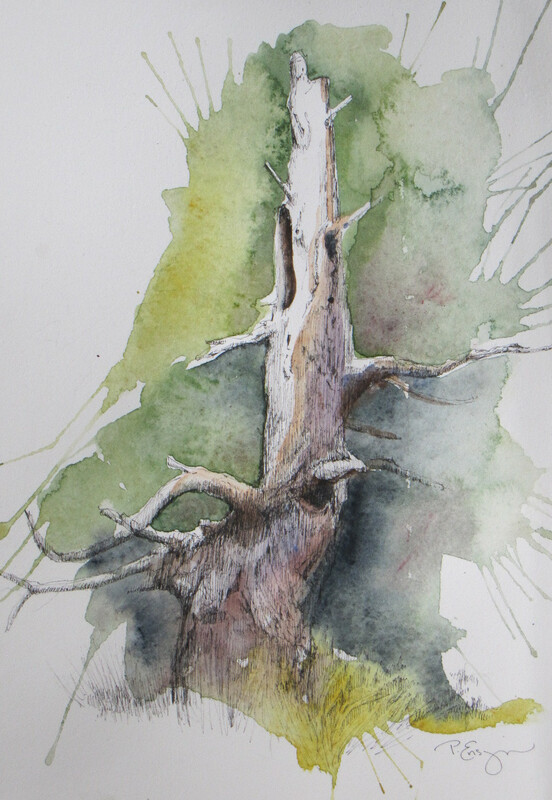 On the way back I couldn’t resist a quick sketch of the graceful stump of the tree at the edge of the woods. I loved the sun-bleached, barkless shape against the deep green of the forest behind. Since I wanted this to be all about the tree, I just drew the tree and let watercolor indicate a background. See image above. So many great subjects on Lopez Island. I can’t wait to go back! You captured these spots beautifully, Paula! I especially love the poppies at Richardson. Would you be interested in selling it? I thoroughly enjoyed the three days with PAWA and hope to join up again for sure. Thanks so much, Carolyn. Hopefully you received my email reply. Let me know if you didn’t.. Fantastic! I love your sketches.